Summary report – October 2012 With ongoing conflicts in Blue Nile and South Kordofan and worsening relations between Sudan and South Sudan, The Elders made a series of visits in 2012 to both nations, to highlight the growing humanitarian crisis and encourage further peace talks between the two leaders. This summary report provides a brief analysis of the visits and the impact of The Elders’ renewed engagement in the region. Peace and security in Sudan and the surrounding region has been an issue of great concern to The Elders since the group was formed in 2007. Their first visit to Sudan was in October that year, when they focused on the human suffering in Darfur. They have been closely following events ever since. In 2012, they decided to make a series of visits to Sudan, Ethiopia and South Sudan, prompted by worsening relations between Sudan and South Sudan, deteriorating economic conditions in both countries, and renewed conflict in the Sudanese states of Blue Nile and South Kordofan. 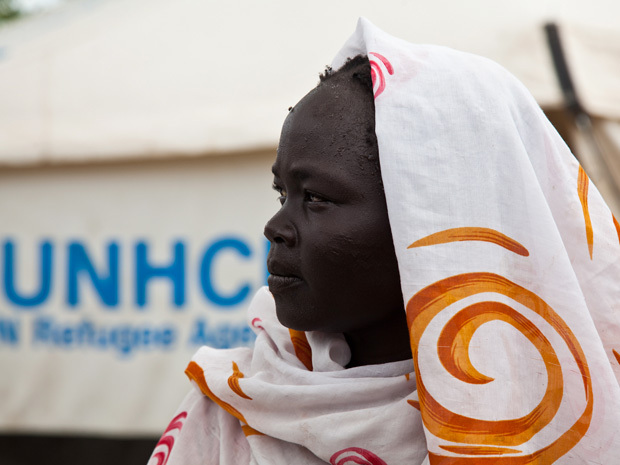 This conflict has created a growing humanitarian crisis: nearly 200,000 refugees had fled to the South Sudanese states of Upper Nile and Unity by the end of September. One of the main aims of the visits was to encourage the leaders and people of Sudan and South Sudan to work towards a more peaceful and mutually productive relationship with one another, and, given the risk of renewed war, to recommit themselves to building two viable and secure states. 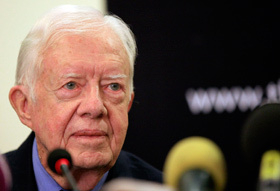 The Elders were also concerned about the crippling dispute over oil, the rights of thousands of South Sudanese living in Sudan, and corruption allegations in South Sudan. As important was the Elders’ aim to draw the world’s attention to the plight of refugees in both countries. The central focus of the visits was meetings with the Presidents of both Sudan and South Sudan. In May, Lakhdar Brahimi and Jimmy Carter travelled to Khartoum, where they met Sudanese President Bashir and senior members of his administration. 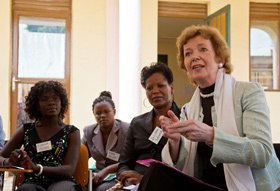 In July, Archbishop Tutu, Martti Ahtisaari and Mary Robinson met President Kiir in South Sudan, together with Cabinet members and senior officials, representatives from the UN and diplomatic community and NGOs – having travelled first to Addis Ababa, to meet the Ethiopian Foreign Minister and high-level officials from the UN and African Union. They took this opportunity to underline The Elders’ whole-hearted support for the peacebuilding and humanitarian work of these two international organisations in the region. While in South Sudan, the Elders made a well-publicised trip to the Yusuf Batil refugee camp in Upper Nile state. Their visit coincided with the eve of the first anniversary of South Sudan’s independence, at which President Kiir was due to make a keynote speech. 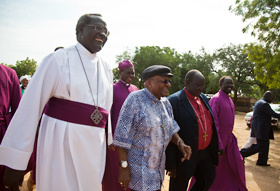 The timing of the visit was therefore particularly opportune, and they were delighted that Archbishop Tutu was invited to give the sermon on the eve of Independence Day at an ecumenical service organised by the Sudan Council of Churches in Juba. The service was attended by 1,500 local dignitaries, including President Kiir, and was broadcast on national radio, the most important medium in South Sudan, where few people have TV or newspapers. The Elders also met members of a women’s network about the challenges facing women and girls in South Sudan, and held an interfaith meeting with religious leaders on peacebuilding, in which they encouraged them to reach out to their counterparts in Sudan. 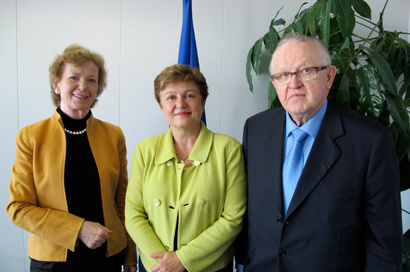 A subsequent well-timed visit to Brussels by Martti Ahtisaari and Mary Robinson came a few days ahead of an EU Foreign Affairs Council meeting that had Sudan/South Sudan on the agenda. The purpose of the visit was to brief high-level EU officials on the Elders’ trip to the region, urge the EU to step up humanitarian assistance to people affected by the conflict in Blue Nile and South Kordofan, and ensure that Sudan/South Sudan remained high on the EU’s foreign policy agenda. The Elders as a catalyst? Sudan and the SPLM-N have signed two Memoranda of Understanding for a ceasefire to allow independent and effective humanitarian access to Blue Nile and South Kordofan states. Presidents Bashir and Kiir have twice held direct talks in Addis Ababa. On 27 September, they signed an agreement on trade, oil, border issues (including a demilitarised zone) and the status of nationals, which will bring the two countries closer together, even if other issues are yet to be resolved. Agreement has been reached to resume oil production in South Sudan and export it through pipelines in Sudan – a major economic breakthrough. Sudan has reopened road transport links with South Sudan. Direct air transport between Khartoum and Juba has also restarted, for an initial period of six months. President Bashir committed himself to withdrawing Sudanese troops from the disputed area of Abyei. President Kiir used his Independence Day speech to state the importance of the mutual viability of South Sudan and Sudan as two states living side by side in peace. One subsequent development to which the Elders contributed was the significant hike in donors and aid delivery to refugees in the following months. Donors included the European Commission, the UK Government, the United Nations (through its Central Emergency Response Fund) and the Omidyar family. In addition, the South Sudan Women’s Empowerment Network committed themselves to developing a strategy to highlight gender issues during the constitution-drafting process. They also agreed to collaborate with Girls Not Brides: The Global Partnership to End Child Marriage, in order to begin addressing the widespread practice of child marriage in South Sudan. The Elders’ renewed engagement with the region was well timed and welcomed by officials in Sudan and South Sudan, as well as the key international actors. 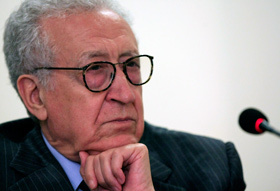 The Elders’ stature as an independent group, without a partisan agenda, helped to open doors and create the possibility of renewed progress towards peace.